Ample space paired with best ergonomics and impressive design - the Nitro Concepts C80 gaming chairs unite all of these benefits into one high-quality swivel chair, which doesn't just easily qualify as a comfy office chair, but also brings all the requirements to the table to be called a veritable gamer chair. The C80 Motion series puts its emphasis on a particularly high sitting comfort thanks to a wider design with thick padding that promises increased longevity too. In addition, this version comes with a black polyurethane (PU) imitation leather cover, whose gorgeous design has been inspired by race car seats, and folding armrest (90 degrees). All Nitro Concepts chair series from the Carbon Class feature a PVC back side covering with an eponymous carbon look. 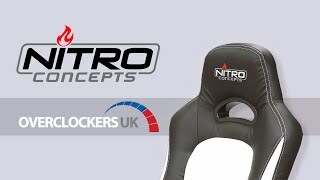 The whole package is being completed by subtle blue seams and a Nitro Concepts logo that adorns the headrest. As an added bonus, a little metal plate with logo lettering is included with every unit to allow you to proudly proclaim your ownership of a Nitro Concepts gaming chair. More links for "C80 Motion Series Gaming Chair - Black/Blue"